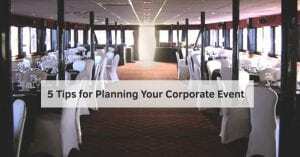 Planning a corporate event can be a difficult and sometimes stressful task. There are numerous details to keep track of, from guest lists to menus and there are “big picture” decisions to make, such as picking a theme. It’s not always easy, but when done right, it can benefit your company, by helping you find new clients, close deals or improve employee morale. Skyline Cruises has been hosting corporate events since 1993 and we know how to help you achieve your goals. We can host all types of events aboard our 3-deck luxury yacht, the Skyline Princess. We can accommodate groups of all sizes and all budgets. Whether you want to charter the whole ship or reserve the deck or even just a table on one of our public dinner cruises, Skyline can make your event happen. And it costs much less than you think. 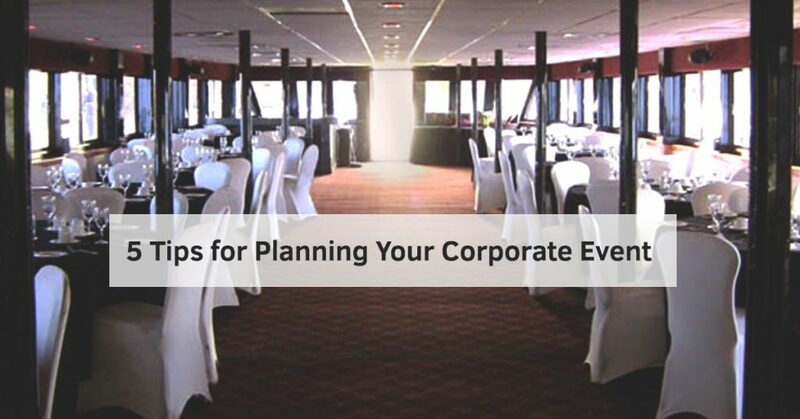 At Skyline, we’ve seen it all, so we want to give you 5 tips for planning your corporate event. This may not be as obvious as you think. Sure there are employees, clients, and guests that you’re almost certain to invite, but it’s important to decide in the early stages of planning what type of event you’re hosting and who your target audience is. If it’s an event designed for team building or to thank employees, your workers will likely be the target audience, but if you’re holding a fundraiser, you want to target clients, philanthropists or business leaders who are likely to donate money. Once you know the purpose of your event and who you’re targeting to attend. the next task is getting them to attend. According to the website Small Business Trends, you should define what you’re doing to attract attendees. It could be freebies, entertainment or a guest speaker. It’s never a bad idea to talk about the sights you’ll see on a Skyline Cruise from the majestic Manhattan skyscrapers to the Brooklyn Bridge, capped off by a stunning view of the Statue of Liberty, or a great Long Island Sound cruise viewing lighthouses, yachts, and mansions. If you’re trying to attract business clients or customers or even just want to entertain your own employees, it’s always good to remember that people tend to schedule family events and functions on the weekend, so it’s good etiquette to schedule business events during the week. Also, keep your eye on the calendar for any common conflicts. Scheduling an event on the night before schools open will hurt attendance. This is certainly the golden rule, particularly if you’re managing your company’s money. Contact Skyline Cruises and tell us what you’re looking for and we’ll try to accommodate your budget. We can help you plan a casual cocktail party or a formal sit-down banquet. If your budget is tight, consider looking for sponsors for your event. Booking a Skyline Princess Cruise will help you create an impressive corporate event. The ship is Coast Guard certified to carry up to 450 passengers. If you’re looking to entertain, the Princess has a dance floor and DJ space on our 3rd level skylight deck. The deck is open or can be fully enclosed depending upon the weather. And speaking of the weather, you don’t have to worry on the day of your event as we cruise all year round. There’s plenty of space for your event, for example, if you want to host a casino fundraiser, we can put gaming tables on one of our decks. Or we can set up a podium for a meeting or seminar. And the food is top notch. It’s all prepared fresh by our in-house chef. If there’s something you’re looking for, ask our event planners. Skyline Cruises has the know-how to make your corporate event a success.